Francis MacNutt wrote about me. I have often asked for God to give me a particular spiritual gift. I rarely have intentionally asked for the fruit of the Spirit. In fact, I have joked for years about not asking for patience because the lessons to learn it are painful! The point is not to separate the doing from the being. The point is that the gifts without the fruit lead to pride and self-aggrandizement. Asking for the gifts of the Spirit and not for the fruit of the Spirit is rooted in selfishness, even when it is born out of misunderstanding. When I ask for the fruit of the Spirit–love, joy, peace, patience, kindness, goodness, faithfulness, gentleness, and self-control–I’m asking God to form in me particular qualities of character. That means it’s who I am all the time. When I ask for Spiritual gifts, I’m asking for something I can use, something I can do when and if I choose. I often teach that ministry is not just what we do, but it is who we are. That’s only true when we pray for the fruit of the Spirit in conjunction with the gifts of the Spirit. When I have the character of Christ, the spiritual gifts become tools which I selflessly use to bless others. The fruit of the Spirit informs me how to use the gifts of the Spirit for God’s glory rather than my own. No doubt about it, I need more fruit. So, God, may I please have some raspberries…and strawberries…and peaches? Maybe a banana and some kiwi? And please don’t forget the blueberries. I need them all! I sit at my desk and gaze out the window at burnished gold and flaming orange leaves heralding autumn. It occurs to me how much I love clean windows! Earlier this morning I looked out through the accumulation of dirt and smudges on the glass and those same leaves looked dull, joyless. So I gathered up my cleaning supplies and got busy. Now, observed through my clean window, the world looks freshly washed. 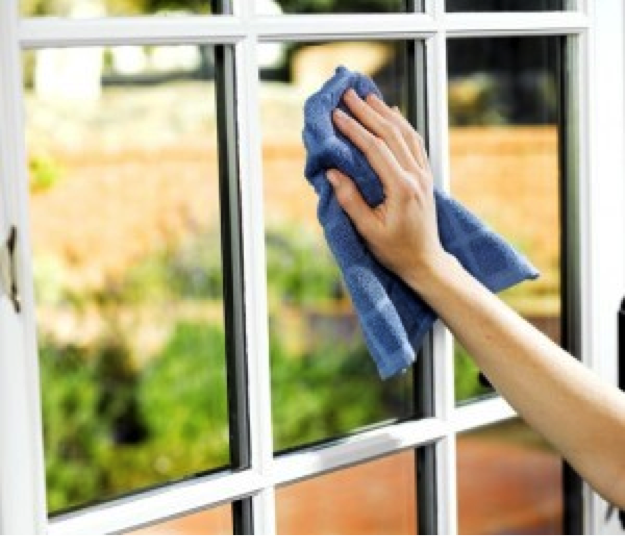 I do love clean windows…but I hate washing them! I procrastinate and complain about this despised chore, no matter how delighted I am with the end result. I can’t afford to pay someone to wash my windows for me, so I’m stuck with doing it myself. Our windows are old, the kind that tilt in, and it requires strong hands to compress the frame in order to release the sash. Sometimes a window frame has become stiff with age and I struggle to get the sash free. When it suddenly pops out, there’s this little “pop” of relief within me…now I can get on with the washing. Depending on the season, the sash may be stuck, not willing to budge no matter how much I push, pull, huff and puff. Those are the days when I’m so grateful for the help of my husband’s strong hands and arms. It’s good to have help when the work is hard! Like looking through clean windows, I love seeing the heart of God clearly. Somehow the world seems freshly washed–and me along with it–when I observe the world around me with his heart. But, just like washing windows, seeing God’s heart clearly requires time and energy…and there are days when I just don’t want to invest in Bible study and prayer, no matter how delighted I will be with the end result. In a different sense, I can’t afford to pay someone to do that work for me (paying the preacher to preach the sermon doesn’t count!) This is work I must do myself. Inevitably, there are days when the framework of my mind has become stiff with age, resistant to the pressure of change. There are seasons when I feel the window of my soul has swollen shut with the cares of life and world, and it just won’t budge. In those times, it takes a strong hand to break those places free…tilting the sash of my soul inward so that God can penetrate my heart and mind. In those times I am grateful for the Spirit’s gift of a listening friend who encourages me until I feel the “pop”, or the one more learned than me who has generously written down the wisdom gleaned from their own study and prayer. Again, it’s good to have help when the work is hard! When my view of life and world is dull and joyless, I know that I’m not seeing God’s heart clearly. I’ve allowed the dirt and smudges of procrastination and complaining to accumulate on the window of my soul. I realize that it’s time to gather up my cleaning supplies–prayer, Scripture, a good friend, the wisdom of a commentary–and get busy. The end result is like looking at the brilliant fall leaves through freshly washed windows…delightful! How’s the view through your windows? Trust me, this not a sappy Valentine’s Day post! Actually it’s somewhat of a response to my last post. To be honest, there was something about that post that felt a little off the mark. Not because I wrote anything untrue. Not because it was direct. No, there was just something missing…something very important. Motivation. The danger of throwing out scripture verses out of context is that they can be misunderstood. One could interpret that post in light of the scriptures I employed as me contending that we should serve others out of a sense of obligation to Christ. Nothing could be further from the truth! Obligation has little to do with it. It’s really all about love. The first step in serving others is to know beyond a shadow of a doubt that God loves me, that I am his beloved child and that nothing can change that. I can do nothing to make him love me more or love me less. And because of God’s love for me, Christ gave up his life for me. Judging by my behavior, I wasn’t worth that. But God sees me differently, and loves me unconditionally. Know what is an appropriate response to that love. Because God loves me–because Christ gave up his life for me–I am motivated to respond. This is not a matter of somehow earning this love. It was already mine, long before I was aware of it! No, this is a visceral response to a love that I really can’t comprehend, but for which I am beyond grateful. I want to respond, I want to return at least a small measure of that love. Not out of obligation, but out of this deep fountain of gratitude that wells up within me. Anticipating this response, Jesus left instructions about how I might express my gratitude and my love for him. Know how to love others. Jesus simply said, “Love one another as I have loved you.” (John 13:34) The way that Jesus loves me is that he gave up his life for me, and now walks with me every day. He points out the people he wants to serve through me. He provides everything I need to do what he asks me to do: the gift of the Holy Spirit, friends who have complimentary talents and abilities so that I do not serve alone, spiritual directors who are willing to share their God-given wisdom to encourage me to become more and more like Christ. All I need do is make myself available to him. And that is what I do, as best as I am able. I make myself available to Jesus Christ. Not out of a sense of obligation. Not because I think I can somehow earn what has been freely given. Neither of these are adequate motivation to go the distance in the way that Jesus calls me to serve. No, what motivates me is love–God’s love for me, understanding the appropriate response, and loving others as Christ loved me.